In her current body of work, Hagit Cohen transforms found natural objects photographically by manipulating light, color, and scale to give them a new presence. Her practice includes walking, looking, finding, collecting, and exposing. Delicate palm tree bark turns into intricate, theatrical shadow play. Tree-seed pods open up in full light to offer their intimate interiors. 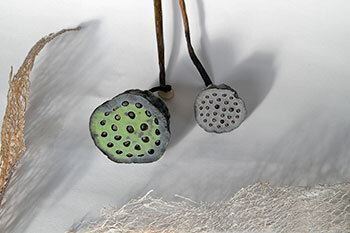 Small, ephemeral objects are turned into looming and mysterious figures, arresting out attention. They take center stage. In opposition to forces that see nature as powerless against man, she works to create images that give it agency, showing that even the tiniest, the most fragile natural objects can render us powerless with their secret beauty. Hagit Cohen is a fine artist who works primarily with digital images, constructing visual scenes with photographic images and objects of ritual. In her work she explores the relations between humans, nature, and spirt and the power of personal ritual to effect healing and change. Hagit holds a BFA in Photography from State Art Teacher Training College in Israel, and MFA in Imaging Arts from the Rochester Institute of Technology, where she also taught fine art photography for several years. Upon completion of studies, Hagit moved to the Bay Area and developed her career in interactive multimedia as an illustrator, art director and producer. In her current work she explores the subject of nature and the environment, and draws attention and awareness to nature’s fragile balance in the face of human intervention. Hagit has exhibited her artwork in Tel Aviv, Toronto, Los Angeles, San Francisco, Berkeley and Oakland. She lives and works in Berkeley, CA. She currently serves on WEAD- Women Eco Artist Dialog board of Directors. Why did you choose the subjects you chose for this exhibit? 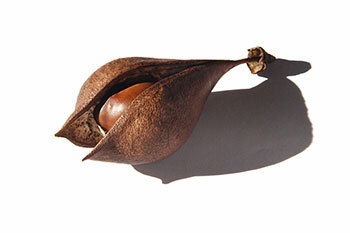 Tree seed pods carry a sense of pregnancy, sensuality, and mystery. They symbolize a hidden potential for growth and transformation. I seek to evoke a visceral experience in the viewer through large scale images of seed-pods from my travels around the world. Their larger-than-life scale accentuate their role in the survival of our planet, and the connection between nature and humanity. Can you tell us a story about how you found one or two of the seed pods? A year ago, I was hiking in the rain forest of Ecuador with a group of people from the Pachamama Alliance, Someone found the “Monkey Comb” pod with a plant growing out of it (I asked for help with spotting tree pods for my project). It was so special. I had to photograph the pod in a short window of time between the rain and best light condition. I also had to capture the images that day before the green plant wilted. It’s the only pod in the show that had to be photographed on-location. What is your most valued tool as an artist? What is the role of your art in our community? I hope to raise awareness of nature’s fragile balance in the face of human intervention. For me, beauty is a spiritual healing force which has the power to transform the chaos within myself and in the wider world.